They’re from the Midwest. They didn’t grow up eating fried chicken. There were no Southern grandmothers with a secret touch. When they went to research the best fried chicken recipes for their restaurant, where did Christine Cikowski and Josh Kulp turn? To Edna Lewis? To Leah Chase? To Carla Hall? No. 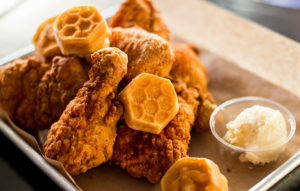 Thomas Keller of all people provided the inspiration for the fried chicken at their Honey Butter Fried Chicken restaurant in Chicago. They brine their chicken in salt, sugar, and citrus chili flakes. They dip it in buttermilk dusted with a combination of wheat and rice flour seasoned with black pepper, garlic powder, and cayenne. Then they sprinkle it with smoked paprika. The customers butter it with the whipped honey butter. The idea of slathering the chicken with honey butter was an accident that happened when some butter melted on the chicken. “OMG. It just popped. It was insanely good,” Christine recalls. In Oklahoma City, I did grow up eating fried chicken and it was often accompanied by Parker House rolls drizzled with butter and honey. Though we never thought of putting the butter directly onto the fried chicken, it’s easy for me to see how delicious this can be. It’s about time it occurred to somebody to go for it. The honey buttered chicken was not their only accidental success. They make a fried chicken sandwich with a candied jalapeno mayonnaise. 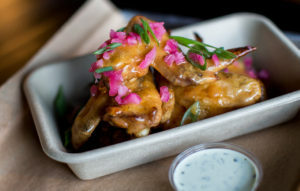 “We puree candied jalapenos into mayonnaise so we’re left with vats of simple syrup,” Kulp said. “So one we day tried making a Margarita with it.” Out of this experiment came a best-selling cocktail which they now serve in compostable corn cups. Josh’s Jewish grandmother did inspire him to render chicken skin into schmaltz and flavor their mashed potatoes with it. And probably something in their Midwest upbringing motivated them to be conscientious about using every last bit and piece of every chicken and everything else. They only buy whole Amish antibiotic and hormone-free chickens and employ three guys to butcher 250 to 300 daily. They make stock from the bones and use strips to make sandwiches and tacos and to top pimiento mac and cheese. They even fry up bits of buttermilk and flour into “crunchies” which they strew over grits. Though their menu will not attract Weight Watchers, Josh quips that these are all ‘local’ calories. Their social consciousness goes beyond waste management into numerous environmental and social justice issues. They even went to Washington to lobby for a higher minimum wage. These neophyte restaurateurs were surprised not only by the success of their culinary accidents but by the instant success of the restaurant itself. “We expected 50 to 100 the first day but we did 400,” Christine recounted. “The second day we did 700.” They were off and running. Now three years later, they’re feeding up to 1,000 a day. They got their start with an underground Sunday Dinner Club in Christine’s apartment. Both Kendall College grads switched careers. Christine was a music major who once aspired to be a singer. Josh had worked in restaurants and then taught school in the Bronx. 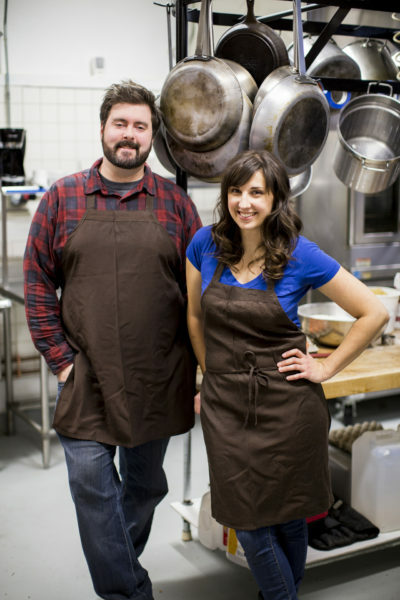 They met in culinary school and decided to join forces and start with small dinners. (For the record, they are business partners, not romantic partners.) Over a decade their subscription list grew from eight to 8,000, so it seemed feasible to open a brick and mortar restaurant. The fried chicken started at their Sunday dinners. Its popularity led them to pick it as the soloist for the debut of their elevated fast casual restaurant. They still maintain their beloved Sunday Dinner Club, which because of its growth, now requires a commercial event space. The rising star chefs were in New York City recently participating at the Star Chef’s International Chef’s Congress, hosting a Super Scrap pop-up, showcasing how they reuse and repurpose ingredients. Beverly Stephen, the former executive editor of Food Arts magazine, is currently an independent journalist and consultant specializing in food, travel, and lifestyle. 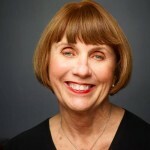 She began her career as a newspaper columnist and reporter with the San Francisco Chronicle and the New York Daily News.